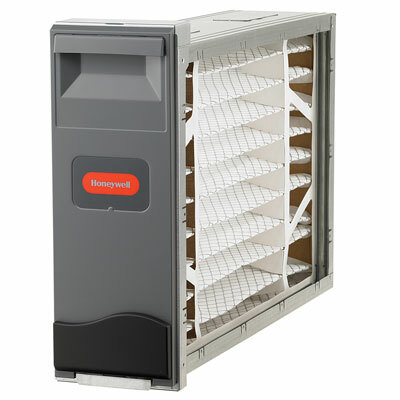 The FC100A1011 (20" x 20" x 4") media air filter is part of Honeywell's whole-house filtration line. It comes included in the F100F media air cleaner or it can be purchased separately as a replacement cartridge for use in any of Honeywell's whole-house media air cleaner units. The filter is an excellent upgrade to any 1" or 2" filter that may be used in a furnace, air handler or return wall cabinet. Two key aspects of the filter are the accordion style design of the filtration material and the approximate 4" depth of the frame. This allows for a significantly greater volume of surface space available for filtration. Typically, the F100F Honeywell media air cleaner is installed with the heating and cooling system during the construction of a new home. It can also be retrofitted to existing systems or installed new during the periodic replacement of a system. In any of these scenarios the cabinet comes equipped with a pop off door. Once the door is removed the existing filter can be removed and discarded and the new replacement filter can be installed. It is possible to upgrade from the FC100A1011 air filter to the FC200E1011 air filter. The two filters are identical in size and function other than the efficiency upgrade of the FC200 series. The FC100A1011 is an excellent upgrade to any standard 1" or 2" blue fiberglass filter. These filters offer very little filtration value and are often referred to as "rock stoppers" in the industry due to their inability to do anything more than block large debris from getting sucked into the heating/cooling system. Better alternatives include media style filters found at local hardware stores. However, these options typically max out at 2" in depth (much less volume of filtration material) and last 1-3 months before needing to be replaced. The FC100A1011 air filter can provide superior protection over such options. One of the main detriments to heating and cooling systems operating at peak performance is debris and other particles coating the fan motor, coil and other components over time. This inevitably leads to higher operating and energy costs, lowers the effectiveness of the system and can cause break downs and/or reduce the life cycle of the system. The filter is the main line of defense in keeping these components clean and operating effectively. The FC100A1011 air filter also provides many advantages in terms of air quality for the home or space it is being used in. Portable or room to room air filtration devices can be effective in small areas. It may be necessary to have such units in every room in your home to provide adequate coverage. The FC100A1011 air filter, used in line as part of a whole-house heating and cooling system, filters the air from the entire conditioned space as it is passed through the filter. The FC100A1011 air filter will typically have higher effectiveness ratings than most 1" and 2" filters. Included below are the air quality efficiency ratings and statistics for the FC100A1011 air filter and comparisons to the FC200E1011 air filter. MERV 11 - (Minimum Efficiency Reporting Value) is essentially a score for the effectiveness of a filter. .23 in.w.c - pressure drop at 492 fpm. Up to 1 year life cycle. Can I Use a Honeywell Media Filter in my Electronic Air leaner? What Does the MERV Rating on my Air Filter Mean? Which Way Should the Arrow on my Honeywell Air Filter Point? » Can I Use a Honeywell Media Filter in my Electronic Air leaner?